Funnily enough, I don't mind the occasional race being shortened by torrential rain or some other disaster; as long as none of my guys are disadvantaged by it, of course. And Heidfeld's superbly timed second place in Malaysia is a good example. It is a pity about the half points but at least Nick gets to kick off BMW's score this year - Nick 2 finishes, Robert 0, is the score so far, I believe. I must also confess to a slight smirk at the sight of Vettel spinning off in the wet. So many commenters have been claiming him as the great rain specialist, all thanks to a couple of performances in the wet last year that had far more to do with the characteristics of the Toro Rosso than any particular ability of Vettel's in slippery conditions. He seems competent enough but needs to put in a few more brilliant wet weather displays before we can crown him as rainmeister. In fact, Webber looked to be the better of the two Red Bull drivers when the rain came and the team has good reason to regret that the end came too soon for him to capitalize on the weather. It needs to be pointed out, too, that Glock's apparent brilliance was purely the result of being on the right tires when everyone else had chosen the wrong ones. It was a gamble by Toyota, almost as dubious as Ferrari's in sending out Kimi on full wets much too soon, and could have ended with Glock looking just as foolish. But that is the name of the game when the rain comes. The man who picks the right tires at the right time is king for a day. So Glock deserves his third place for tactical choice, but let us not get over-excited with thoughts of a new star emerging; he drove no better than Trulli (who has all my sympathy at the way in which events robbed him of a certain second place). Nick Heidfeld was lucky too but deserved his reward for his perseverance in starting with a massive fuel load and stopping for tires only once. He was the one who decided against changing the tires again as the rain became heavier and it turned out to be the right call. When you're right, you're right. I never did see the attraction to kers from the start. I mean, I love the idea of it as far as it is giving the engineers something new and interesting to work on and I can see why a little extra power at a critical moment would appeal but really, I just don't see the ethical difference between this and other driver aids that have been banned. And I'm very curious to see how you get away with not saying "told you so" today. FIAsco is the correct description if ever there was one. It is true to say that my post on the dangers of a 5:00pm start in Malaysia turned out to be correct; but many others did the same and so there is little point in saying "I told you so." The combination of poor evening light coupled by rainstorms was always likely to cause problems during the race. There is an earlier post that gives me much more satisfaction, however, and that is my first look at the new Toyota TF109. I had a hunch then that the new Toyota was going to be good, even tipping it as a good bet for the championship, and it is proving to be all I said it would be. Admittedly, I missed the trick diffuser - but then, none of the photos of new car launches ever show what is happening in and under the rear. Such important areas are kept under wraps as long as possible by all the teams. It was the overall look of the car that alerted me, its balance and clean design, its avoidance of complex detail. It is a complete concept, not a bunch of ideas collected and joined together by a bit of car in the middle. I think I caused quite a bit of laughter as a result of that post, so used to Toyota's under-achievement are we, but it becomes my turn to laugh now. In Malaysia, the Toyota was the only car that could live with the Brawns and it was in with a good chance of both pole and the win. Now who would bet against it taking a win or even a few this year? So there, Vera, you have an "I told you so" from me at last. And I can tell you, it's worth hanging on for that moment - there is so much satisfaction in saying those words when the prediction has been unpopular and the wait long! I enjoyed the Australian GP much more than this one; talk about anticlimactic. One interesting thing that popped into my head as I watched Vettel spin and stall (probably at the same moment that you were smirking) was the realization that a KERS device might serve as a starter when the car has stalled. I am sure the start procedure is incredibly complex, but the advantage of being able to restart a car after a spin would be an additional offset for the weight penalty of carrying the system. I wonder if there is anything in the rules that would prevent a team from creating such a procedure? Just a thought. I would prefer to have a do-over on this race. All the driving before the rain was so interesting. So many deserving teams and drivers lost the opportunity to show what they had. But just imagine how the FIA would abuse a 'do-over' clause in the rules. One positive: I like seeing Bernie eat crow. I loved the race as long it was dry. I enjoyed seeing Rosberg in P1 in the beginning. It was also a joy to see Trulli. But the race was over to soon. The Red flag gives me an empty feeling. The short race showed me that the suggestions about making the races shorter absolutely is not for me. good one! and completely unexpected, of course. i have to admit that i'm surprised that i'm enjoying this season so much (could it be because the "usual suspects" have basically been delegatgd to being the best of the rest so far?) i'm more amused by the fia decisions and the rest of thel hooey going on than i am aggravated. Must say I enjoyed the half race a lot more than many of the "processions" over the last few years. Also since I keep my own points after the Spa debacle my enjoyment of F1 has improved by a factor of 3 times. No longer is one at the mercy of Max and Bernie. The table below is not perfect but at least one doesn't have to take lessons of truth from the best of Fleet Street, Max and fellow F1 competitors who appear to think of themselves as Corinthians from the way they come across on TV and media. So after giving LH 3rd place in Melbourne and keeping Trulli at 4th and no changes in Malaysia, my table looks like below. For marc above, (the first posting) ... KERS can not engage until the car is moving 60+ mph hence it is useless as an 'engine starter' and it doesn't work 'off the line' when the lights go out ! Requires 60+ mph minimum. Hamilton, MBE, lied, fibbed, gave mis-leading statements, or all of the above, he threw away his reputaton as a sportsman. What he did to Trulli/Toyota was a crime and to merely loose 5 points seems a light punishment in my book. Would YOU do that to someone? The Malaysian race? I more or less agree with Clive, it was fun watching the chaos and I didn't mind it ending early. Vettel who gets high marks for wet driving ...... his reputation took a hit and Massa whose reputation for sliding about in the wet ..... is anyone giving him CREDIT for todays 'good' performance. It's awfully quiet out there. And what about the new team, Brawn, can Button really win three in a row? You can't bet on him because the odds pay so poorly, Has it ever been done...three in a row? Regarding the advantage of KERS, it seems to me that KERS is the way of the future. The teams that were early adopters may be struggling with weight distribution at the moment, but that is an engineering issue that can be worked on and solved over time. Being down 80 hp for 6 seconds a lap is a deficit that can never be engineered away. The teams without KERS may gain in the short run while their opponents struggle to come to terms with it, but eventually they'll get it solved, and then the late adopters will have to go through the whole learning curve just to catch back up while their rivals have it already perfected. Marc: I think Number 38 has answered for me regarding the use of KERS as a starting device. No doubt the system could be designed for such a purpose but the rules would get in the way, I think. Re-running a GP would lead to enormous logistical and expense problems. All the pre-arranged transport and accommodation details would have to be changed, the circuit re-booked and extra fuel and tyres supplied. That alone would be sufficient to prevent the idea, without even considering the outcry from the TV broadcasters. I would love to see Bernie eating crow. The trouble is that he just blames someone else or changes the subject. Hezla: Yeah, one feels a bit cheated when a really good race is cut short. But as long as it only happens occasionally, it can be borne. The problem is that Bernie's twilight races increase the likelihood of it happening. Vera: That's a point, actually - what on earth would I write about if it weren't for the antics of Max and Bernie? KP: Unlike Number 38, I like your alternative points table. The gnome and his sidekick might have all the power in reality but they can never enslave our imaginations. Number 38: Whatever Hamilton and McLaren did, the fact remains that Trulli fell off the track while under the yellows. Other competitors actions thereafter do not alter the fact that he was passed legitimately and then regained his place through a misinterpretation of the rules. You're quite right about Webber, too. Poor guy has the worst luck in the business! As for three in a row, I'm pretty sure that has been done many times in the past. But three consecutive GP wins by a "new" team, that might be a first. Mark Z: Time is what the KERS teams do not have, unfortunately. If it were as easy a problem to solve as getting the weight distribution right, some would be getting it right by now - but they're not. They have less than half a season to squeeze an advantage from their systems or they are wasting their time and money. By midseason, the non-KERS teams will be so far ahead as to be uncatchable. And there is no point in devoting this year to solving the problems. Next year there will be a standard system and everything they learn about their present systems will be useless therefore. KERS is a blind alley that F1 would be better off without. Joking aside I thought the race was quite eventful before the rain shower , felt a bit robbed of what would be 23 laps of what might have been quite good action (race would have likely been restarted if it weren't for falling light levels - everyone seemed to ignore Article 5.3). KERS so far seems to be quite an interesting tradeoff between running less ballast and having an extra 80 bhp for 6.7 seconds thus far being good for racing cars for track position , but I rather suspect it's simply not worth it as you said Clive - you'd be fast enough to qualify better and not race those cars in the first place without it. The race starts at 07.00 PM local time here in Australia. The outfit that shows F1 here puts all the races on at about 11.00 PM but by the time it extends the preceding programmes, which are mindless rubbish, with add breaks, the F1 programme usually goes to air at about 11.30. We then get a pretty poor wind up from two ginks pretending it's live and switch to the Beeb at the last minute to save money on the feed. By this time it's nearly midnight. I had left Live Timing on from the qualyfing session and in the early evening I went to the office for some reason and was tempted to follow the race at that point...........wish I had, then I could have had an early night. Anyway, it was a great race while it lasted and being a Formula one tragic for over 50 years I'll probably do the same thing in two weeks time BUT I'll think about Live Timing a bit more seriously I think. Good to see some overtaking at last, Webber had the bit between his teeth so it looks as though Adrian Newey has done the job; it would be interesting to see the Red Bull car with the right diffuser. Leslie - get yourself a HDTV so you can watch Ch1. Their telecast was live at 7pm. They also re-show the race of a tuesday night, if you miss it. I thought the race was an absolute corker, and I feel very shortchanged that it was red flagged. I was looking forward to seeing what Webber, Glock and Rosberg could do. Ch1 won't get to my part of rural NSW until mid-year. Perhaps the British GP. Agree with your race comments and I thought Webber could have been much higher too. It's funny in light of your posts comparing F1 and Nascar that we got what essentially what a Nascar lottery end, Jenson win kind of hide that, but had the red flag come one lap earlier Glock would have being in front. Another FIAsco from the FIA, I know that they are not in control of the weather but surely an earlier start would have reduced the possibility of this happening. I was also dismayed by the mess once the race was stopped. no one had a clue what was happening and we sat there for 30mins while the FIA secretly went about their business in the background. If I was confused then surely any newcomer to F1 was utterly baffled! Why on earth could they not do more to tell the tv stations (and therfore the viewers) what was happening. I think it was a shame for all that suffered as a consequence of the last full lap rule as they had legitamately got to the red flag in the places that they did. However my biggest problem is with the Half points system. Why on earth is this in place? What reason other than to confuse the hell out of the fans is the function of this rule? It like many other F1 rules makes little sense to me. We now have the stupidity of some drivers being on .5 of a point! On the bright side, Button had another solid race after his poor start. Glock and Kimi showed that tyre choice is king and Hamilton again showed his class by squeezing some points out of that poor Mclaren. It was just a shame Rosberg did not place higher as he was driving a fine race. I have not seen anything about Kovilinen who looked to have a car problem. The commentators claimed it was a driver error, but the car went off in a very strange fashion, vering off at a right angle. I was under the impression that there were no HD feeds of F1 which is why the BBC have not been broadcasting in HD. Heidfeld did not deserve second place, he just had a big stroke of luck. He went onto wet tyres at the worst time and was overtaken by at least a dozen cars. After 4 or 5 laps like that, he was about to come in to put inters on like everybody else and only when he was a few hundred meters from pit entry did he notice that it was raining harder and then decided to stay out. Very lucky set of circumstances - but he did make the wrong tyre choice and didn't deserve the podium. @marc: cars can't be started by KERS, and the system actually doesn't work unless the car is moving at 100km/h or more. It adds torque to the drive train, it can't move it itself. Vettel's problem was that he was on inters and couldn't make it around to put the full wets on. He spun out a like a lot of other drivers did but in his case his anti-stall let him down when it didn't kick the car into neutral. Also on KERS, most teams will adopt it before the end of the year if only because it offers such an advantage during the race. Most of the teams that currently don't run it have an existing engine supply deal so the KERS will go along with that (eg. Brawn from McLaren, Red Bull from Renault) and since they will be KERS customers they won't have the learning curve issues (other than optimal car balance). @Leslie: I am also in Australia at the moment, and what Ch10 did was complete barbarism. Those commentators are absolute muppets - they said that they were having technical difficulties getting the BBC commentary but it simply isn't true - they just wanted to do a bit more commentary themselves (and it was hopeless). 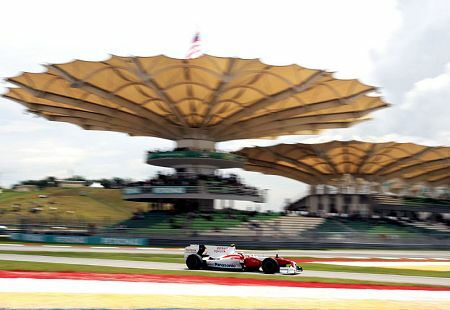 In terms of pure speed and racing, Heidfeld did not deserve second place in the Malaysian GP. But in terms of strategy, no one does it better than the man. Indeed he went on the wrong set of tyres, but he preserved them for the expected downpour. That is why he lapped slowly and hence, being overtaken by a number of cars. He made the right call not to pit for the second time and I'm very sure for every other driver on the grid, none of them can make more professional and decent judgement than what Heidfeld has done for the past few years in F1. It doesn't matter how well you did in qualifying (hint: Trulli) and practice (hint: Rosberg), but if cannot deliver the results during race, it doesn't really matter at all. What I can sum up is that Heidfeld is the type of driver who delivers the goods and does it consistently and reliably. And now, for the elusive Grand Prix win. Go go Nick! Francois: Actually, no joke - twilight races would make some sense in Europe where there is such a thing as twilight. As you say, times could be arranged that would suit viewers just about everywhere. And there would be no danger of the typical tropical scenario of torrential rain at 1:00pm and 5:00pm - a bit of a shower would be the worst possible scenario. Leslie: I see the Ozzies are trying to sort out your viewing problems - no need for me to get involved, therefore! I have Live Timing open on the computer while I watch the race on TV and find it useful to have the extra info it provides. It can be a distraction, however - always seems to be the moment when I glance at the times that something happens in the race! Some of that was thanks to the RB5 being a better chassis than the MP4-24, of course, but McLaren do seem to have made their KERS system the most effective of the bunch. Filipe: And it wasn't just the end that brought memories of NASCAR - the Webber/Hamilton fight produced a NASCAR-like number of overtaking moves! Nik: Yes, Heidfeld was lucky in the timing of the arrival of the rain. But so were most of the drivers who finished in the points, especially Glock, whose gamble on intermediates when everyone was choosing full wets paid off. Had the heavy rain arrived earlier, Glock would have looked as silly as Raikkonen did. But Heidfeld's second place was not entirely due to luck anyway - he also reaped the reward for starting with a heavier fuel load than anyone else, thereby giving him freedom to choose his moment for switching to wets. He was a little early in opting for full wets when he finally did change but saved himself a pit stop by staying out rather than changing to intermediates for the few laps left before the heavy rain. It was during this time that he was passed by several cars but staying out when they went pitted put him in second spot. We expected wet weather conditions so we sent him [Heidfeld] out on a high fuel load and he was just able to stay out until the rain came. It meant he could do it on one pit stop, which was a very good strategy. Then in the wet, I have to say Nick did a fantastic job. He had been on his wet tyres for very long already when it really poured down, and the car was undriveable. We were ready all the time to service him, but he decided lap after lap to stay out, and he finally managed it until the red flag. That was the key then to P2 - and it tells a lot not just about Nick's experience but also his driving capabilities in the wet. That was really very good. As for KERS, explain to me why you think that it offers "such an advantage during the race." As far as I can see, it is a handicap in both qualifying and the race - witness the battle between Webber and Hamilton. KERS kept Lewis in the fight for a while but Webber won in the end, the better lap times of his KERS-less car proving the deciding factor. Brawn could have the McLaren KERS system now if they wanted it - Force India will have it in Europe, they say. But Ross seems in no hurry, beyond making a few noises about sometime in the future. And even those statements are to mislead the competition into persevering with a technology that is doing them no good whatsoever. They really ought to know Ross better. Dennis: Absolutely correct - Nick Heidfeld is the man! Racing is not just about going fastest; racecraft matters too. And the driver who can compensate for not having the best car by making good strategy calls often beats drivers who are theoretically quicker.